Sparta Rotterdam youth product Rimkus went abroad in summer 2007. In winter 2008-09 he moved from Lierse SK to KV Turnhout for the rest of the season on a loan-transfer. His 2-year contract expired in June 2009 and he was not offered an extension. However, he extended his stay at Turnhout with a new contract for the 2009-10 season. At the end of the season the contract was not extended. 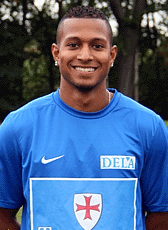 He returned home and moved in July 2010 to the Topklasse (Third division) club ARC. In mid-season 2011-12 he moved abroad again. Rimkus signed a 2-year contract at Indonesian outfit PSIM Yogyakarta. He joined the club together with Dutchman Emile Linkers (also former ARC) and Kristian Adelmund (Capelle). He left Indonesia in 2012 but his status in 2013 is unknown.